When people tell me that they read Harry Potter in their childhood I will now feel extremely concerned because how can someone READ something like that when they’re like, EIGHT YEARS OLD?!?! WERE YOU SO TRAUMATIZED WHEN YOU WERE EIGHT YEARS OLD?!? DID YOU NOT GO INTO DEPRESSION WHEN YOU WERE EIGHT YEARS OLD AND YOU READ ABOUT THE DEATH OF ALBUS DUMBLEDORE?!? HOW COULD YOU POSSIBLY HAVE HAD SO MUCH FAITH IN THE FACT THAT EVERYTHING WILL BE OKAY??? *breathes* Okay, time to push that to the side and start a review. If I can write one. Since I’m not capable of thinking right now. But that’s okay. Anyway, Half-Blood Prince starts off with Harry in his second last year of school at Hogwarts. Besides the fact that I was already traumatized from Order of the Phoenix, I can only say that J.K. Rowling was probably laughing in my face while I was reading this book and thinking about the amount of trauma she’ll be able to cause me now. I’m pretty sure he almost or actually did end up missing a Quidditch match just because Malfoy was not playing. Ron and Hermione would like each other! It’s cute and funny! But I’m not sure how I can see them ten years from now! I like Harry and Ginny, too. Both of them are so adorable! avoiding Hagrid as much as possible and trying to avoid the funeral. Funny, considering that’s what got Harry to get the memory out of Slughorn, anyway. Although this book had a bit more drama in my opinion than anything in the beginning and the middle, it was slightly fleshed out with Harry and Dumbledore’s meetings. The world building and the additional tension to the plot were amazing! It’s probably my favorite book in relation to additional world-building! I also really like learning more about Lord Voldemort! Of course, I’m not picking up Deathly Hallows right away, since I have a pile of books at home to read, anyway. But, considering the amount of time that I need to probably accept the fact that there will be more “sad things” happening. 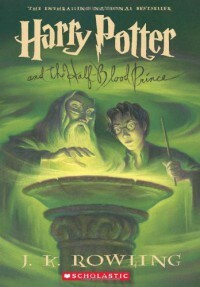 Overall, Half-Blood Prince is a great, consistent addition to the Harry Potter series that keeps getting better and better! Can’t wait—although, I think that I really can, based on the fact that things are probably about to get worse—to read the next one!